The high-octane, calumny-filled campaign for the assembly elections in Punjab and Goa ended on Thursday. 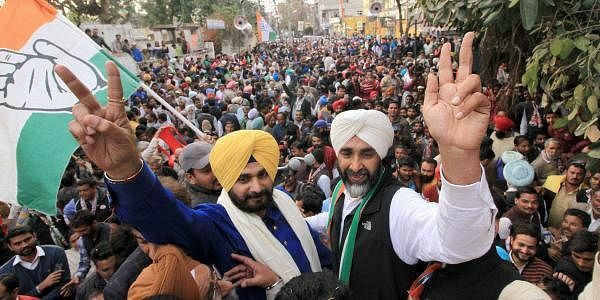 CHANDIGARH: The high-octane, calumny-filled campaign for the assembly elections in Punjab and Goa ended on Thursday. The gruelling campaign concluded for all the 117 seats of Punjab and 40 of Goa on Thursday evening ahead of the Feb 4 single-phase polling in the two states where BJP is in power. Congress vice-president Rahul Gandhi accused AAP national convener and Delhi Chief Minister Arvind Kejriwal of helping forces whice want to disturb Punjab’s peace. Addressing a rally in Ballian village in Sangrur, Rahul said, “Kejriwal is backing the perpetrators of Maur blast. If these elements gain strength in Punjab, then it will hijack all the development issues,” he alleged. Dressed in blue denims, white kurta and jacket, Rahul ate food with fellow villagers in the community kitchen in order strike chord with them. Shiromani Akali Dal (SAD) president Sukhbir Singh Badal asked Kejriwal to tell Punjabis why his party had provided political shelter to the prime accused in the Bargari sacrilege case. The two bothers - Rupinder and Jaswinder — who are accused in the Bargari sacrilege incident, were campaigning for the AAP, he said. “Kejriwal says his government will punish those responsible for the sacrilege at Bargari if his party comes to power. Then Why is he supporting both the brothers. Kejriwal is in truck with hard liners,” he alleged. Meanwhile, the AAP on Thursday released the report of Zora Singh Commission set up to investigate the killing of two persons in police firing on peaceful Sikhs protesting against sacrilege of Holy Guru Granth Sahib at Behbal Kalan in Faridkot district on October 14. The report, a scathing “criticism” of Police action was kept under wrap by the Punjab Government. Giving details of the commission’s report, he said as per the report the two youths were not killed in exchange of fire as claimed by the police. The commission has clearly stated that victims were in a sitting posture, he alleged.